A California girl born and raised, ever since I was old enough to recognize the difference I've boasted Alaskan king crab has nothing on Dungeness crab. Of the latter from California's northern coast, I still claim proudly that when it's in prime season, Dungeness is so sweet and succulent it doesn't need drawn butter or cocktail sauce. Of course that's true of all crab—rich or spicy sauces only mask its sweet, subtle flavor. But it wasn't until last week that I realized there's more than one type of Alaskan king crab—there are four species. As a former professional chef I should have known better. WEAR A BIB: King crab won’t easily surrender but is well worth the battle, at Cracked Crab in Pismo Beach. I'm such a loyalist I tell everyone I'd choose Dungeness crab over lobster any day. But when I learned that Cracked Crab in Pismo Beach was offering fresh Alaskan king crab at the peak of its season, I stopped by to give it another chance. In fact, I'm not sure I ever had it fresh until now. When I arrived I discovered Cracked Crab owner Mike Lee had two types of fresh Alaskan crab, the red king crab and Bairdi (bare-dye) crab. The former looked exactly as I expected but the Bairdi looked like snow crab and Lee said it's related. But those gigantic legs were so sweet and tender, I told him it was far superior to any snow crab I had ever tasted. Lee explained, "My staff is divided over which crab is better, but I prefer the red." I understood after tasting it; it's more flavorful, compared to the Bairdi. Still, I preferred the melt-in-your-mouth texture of the Bairdi. And I liked it even better when I doused it with a squeeze of fresh lime. Honestly, the bright citrus note enhanced the sweetness of both the Bairdi and the red king crab. The fresh crab is priced by the pound and it doesn't come cheaply. The Bairdi snow crab is $39 a pound and the red king crab is $49 a pound. They also have live Alaskan Dungeness crab in tanks; the complete dinner for about a two-pounder is $49. The crab dinners come with seasonal vegetables, basmati rice, and warm sourdough rolls. If you only want a taste of the crab you'll find it among the appetizers. 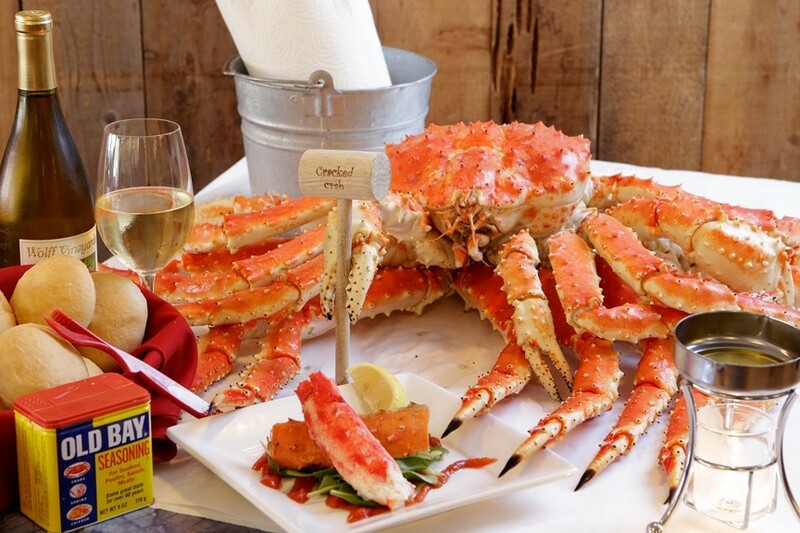 The red Alaskan king crab on the half-shell (a leg section split in half) is served with cocktail sauce for $14. Six weeks ago, Lee and his executive chef Mike McGourty traveled to Dutch Harbor, Alaska, for the opening of crab season, staying from Oct.19 to 27. Lee quipped, "I went there because I had one question: Why am I paying so much more for this crab than I would if I bought it at Costco?" Their Alaska trip was arranged by a seafood broker who supplies their crustaceans. The men boarded the Arctic Sea, a professional fishing boat, to participate in harvesting the spiny creatures. Lee said it was the same crab caught on the reality TV show, Deadliest Catch. During the 14 hours they were on board, the professional fishermen hauled in 160,000 pounds of red king crabs. Each crab pot, baited with herring or codfish, weighs 700 pounds empty, requiring a crane to hoist them into the sea and pull them back onto the deck once they're full. Although it was McGourty's first crab fishing trip, the Nantucket native said he's always worked with fish. Lee experienced Alaskan fishing two years earlier. "The first year I was there, the Bering Sea was calm, but this year we went out in a storm," Lee recalled, smiling broadly. "For me it was much more real to be fishing during a storm." He said they were on board with chefs and restaurateurs from several different countries, all of whom were there to learn more about shellfish. Obviously, they weren't allowed to come in harm's way, but they observed and snagged photo opportunities. They toured the Unisea plant, where they saw the entire process of preparing the crabs for shipping both fresh and frozen products. Lee said the sanitation levels impressed him. He added that he's visited Dutch Harbor twice, in addition to Sitka, Juneau, and Nome. "When people look at the name of my restaurant, I figure I had better know what I'm talking about," Lee said. McGourty's menu changes daily, so choices and prices change year-round. But don't let the high price of fresh crab scare you. This comfortable restaurant offers some pretty fair prices, too. I enjoyed the fish taco, San Felipe style, with fresh-cut fries; my server described it as "the best fish taco in town." The menu offers two fish tacos for $9, but you can order one for just $6 and it was plentiful enough to satisfy my appetite. Admittedly I enjoyed the small crispy chunks of battered and deep-fried Alaskan halibut so much I wished I had ordered the full plate. Served on a corn tortilla, the crunchy fish is topped with freshly shredded lettuce, tomato, onions, a tangy tomatillo mayonnaise, and a side of salsa (the recipe from a restaurant in San Felipe, said Lee). The fries are hand-cut and among the best I've had anywhere in the county. The cup of chowder, $4, is thick with clams and potatoes. The small but well-chosen wine list offers a terrific selection of local wines appropriate for the menu. I ordered the Tolosa 2006 No-Oak Chardonnay, only $6.25 a glass, reasonably priced for a restaurant. Its bright fruit and citrus flavors made it perfect with the fish taco. The list offers a choice of varietals from Chardonnays and Sauvignon Blancs to Cabernets and Pinot Noirs. They also have a selection of older reds in a section called Kath's Private Stash, named for Lee's wife and partner Kathy. You can reach New Time's Cuisine columnist at khardesty@newtimesslo.com.